Malignant mesothelioma is generally divided into three histological categories, or types of cells: epithelioid, sarcomatoid and biphasic mesothelioma. Within each of these mesothelioma cancer cell types, subtypes exist. Many mesothelioma patients display more than one cell type. The diagnosis of mesothelioma cannot be specifically by lung x-rays or other types of imaging, because many different types of cancer can be present in the lungs. The images show only that a tumor may be present, but does not provide an indication of whether the tumor is mesothelioma. A biopsy must be performed where the mesothelioma cancer cell types are used to distinguish mesothelioma from other types of cancer, such as lung cancer. Epithelioid mesothelioma is the most common cell type, constituting approximately 50% to 70% of all malignant mesothelioma. These cells are relatively uniform in shape and have a tubular pattern with a distinct cell nucleus. The individual cells are shaped like cubes or multi-sided boxes. Because of the similarity between adenocarcinoma and mesothelioma cancer cells, they are often confused and mesothelioma can be misdiagnosed. Inspection of the cancer cells under high-powered microscopes and identification of unique characteristics of the chemical properties of the cells can help make the proper diagnosis. Sarcomatoid mesothelioma is the least common type of mesothelioma cancer cell and accounts for approximately 10% to 15% of malignant mesothelioma. These cells typically have more of an oval, irregular shape and the nucleus of each cell is not as visible with a microscope as the epithelioid mesothelioma cancer cells. Because of the similarity of appearance, the sarcomatoid cancer cells can also easily be confused with the more typical sarcoma cancer cells. 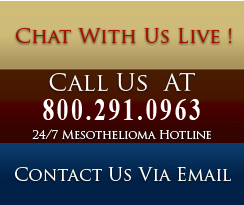 Learn more about sarcomatoid mesothelioma cancer. Approximately 20% to 40% of the mesothelioma cancer cells fall into the biphasic category, which is combination of the sarcomatoid and epithelioid types. The biphasic type can occur with the two types of cells intermixed continuously throughout the tumor, or with them in specific groupings. Transitional areas between the two cell types are often present. Learn more about biphasic mesothelioma cancer.